Cats In Boots frontman Joel Ellis is teaming up with his son Joey Angel for a project simply called Ellis & Angel. The duo have started a Kickstarter campaign at www.kickstarter.com/projects/ellisandangel/father-son-music-act-ellis-and-angel-1st-cd-promo in order to raise funds towards their debut album and possible tour to promote it. “After stepping away from the limelight and into the super cool journey of fatherhood, my super talented buddy Joey and I are now ready to breakout pro as the father and son music artists Ellis & Angel,” states Ellis. Joel Ellis has been a veteran professional recording artist since the late ’80s with notoriety as a highly respected vocalist, composer, and performer. He is known for his international/world music charting success as the lead vocalist and frontman for his bands Cats In Boots and Heavy Bones as well as his solo recordings. Joel temporarily left his professional career to attend to his ill father and to raise Joey as a single father in Cleveland Ohio and Los Angeles. 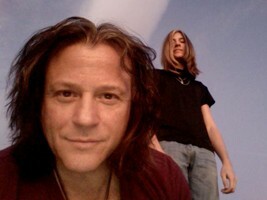 Now 17 years later Joel and Joey are writing, recording, and performing together in a professional capacity in Ventura County and Los Angeles. Samples of the Ellis & Angel project can be heard at www.ellisandangel.com and www.facebook.com/ellisandangel.